In late fall 2008, TDmonthly Magazine polled 44 specialty retailers on their sales of arts and crafts items. In this staple category, sales underscored the wild popularity of Orb Factory's Sticky Mosaics. “It came from nowhere and is doing great,” Michael Ziegenhagen, owner of five Playmatters stores in Ohio, told TDmonthly. Last year, the product was mentioned by only a few retailers polled about top arts and crafts. Other top-selling lines included Creativity for Kids and Alex, with simple activities for younger children and more elaborate, design-oriented sets for older ones. Here are the top-10 best-selling craft items. No manufacturer paid to be included in this article. All products listed were chosen by editorial staff based on research, without regard to the company's relationship with ToyDirectory.com/TDmonthly Magazine. This kit includes four big, chunky pull-back monster trucks, ready to take a custom paint job and adhesive decals dreamed up by a young designer. On their giant wheels, these lifted pickups are fit to race, roll, and smash their way around. The early auto enthusiast is provided with the four assembled trucks, acrylic paints, a paintbrush and two sheets of stickers. — “From Creativity for Kids, the [Monster Trucks] have been great,” John Naisbitt, owner of Thinker Things in Del Mar, Calif., told TDmonthly. — “Monster Trucks … sell well,” said Jeanette Lauture, owner of Aunt Jean's Toys and Treats in Montclair, N.J.
— “It's a great line; we sell tons,” said Jake Thomas, co-owner of Applause Toy Store in Bracebridge, Ontario, of Creativity for Kids, which 20 percent of 44 retailers listed as their best-selling craft line in fall 2008. Hours of creative entertainment for the young jeweler are packed into this boxed learning-activity-turned-craft. Kids can use the bright laces, various shapes and alphabet beads to create keepsake jewelry for themselves or parents, or use the kit as a reusable lacing set to practice spelling and patterning. — “The Melissa & Doug bead stringing kits” are the best-selling craft item at Let's Play in Hillsboro, Ore., Owner Shirley Reilly told TDmonthly in fall 2008. Reilly said she sells around 20 kits per month. 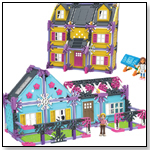 — Fifteen percent of 44 retailers said Melissa & Doug supply their best-selling craft kits. PlayFoam 12 Pack by EDUCATIONAL INSIGHTS INC.
Tactile, colorful PlayFoam never dries out, can be molded and sculpted, leaves no residue, and sticks best to itself rather than the many surfaces of a home. Whether constructed into elaborate art projects or simply enjoyed for its unique texture, this double pack of PlayFoam in 12 colors contains enough to share. — “PlayFoam is still strong,” said Janet Gregory, owner of Over the Rainbow Toys in Anchorage, Alaska. — Of 44 retailers surveyed in late fall 2008, seven percent said PlayFoam is one of their top-selling items.